I am sure that I've listed my domain in "App Domains" list (see screenshot). Could you please help me to investigate what exactly is wrong? You can try it here https://forum.avangard.org.ua/ . It gives error in ukrainian language because I am from Ukraine but it's easy to find translation. I am sure that I configured app secret and id correctly. Hello, thank you for using my plugins. 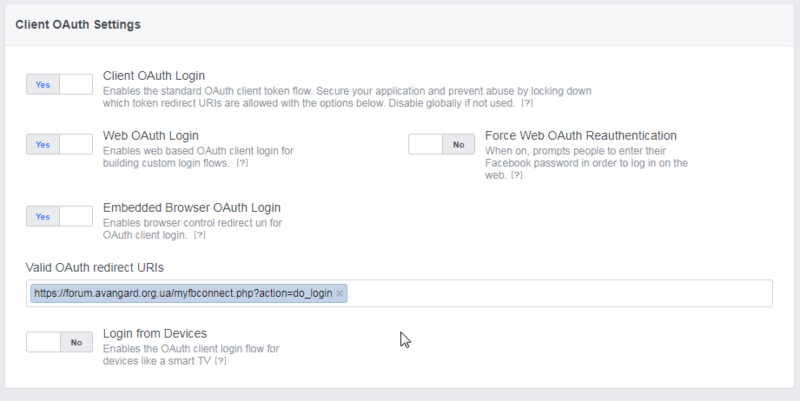 In Valid OAuth redirect URIs, just add the forum domain. The issue is most likely linked to that. If I'm not mistaken, you could as well leave it empty. Hello, Facebook doesn't allow me to leave it empty. With https://forum.avangard.org.ua/ it doesn't work. If I type there something wrong like https://forum.avangard.org.ua/blablabla, another error appear, on facebook site it shows a message "URL is blocked"
Try to enter the domain, without the forum subdomain. 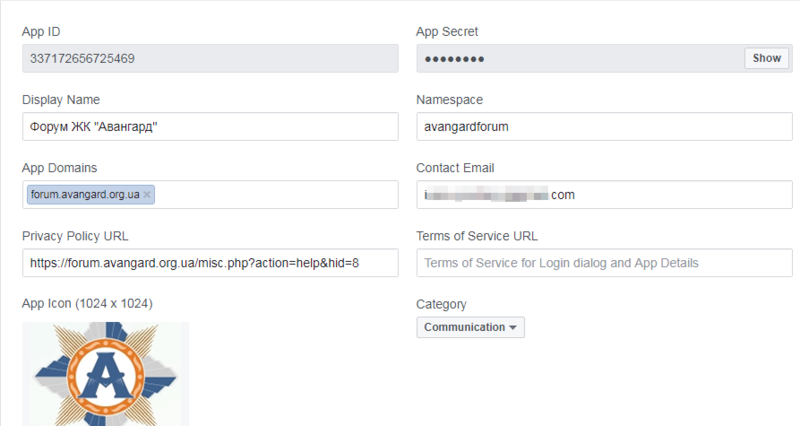 If I type something instead of "https://forum.avangard.org.ua/myfbconnect.php?action=do_login" it shows an error (screenshot). Why do you think it could work for "avangard.org.ua"? It's a completely different site. If I had site smth.us.com should I print just "us.com" in the redirect url field? I understand now that my issue is not typical and I should insert trace statements into php code and debug it mysef. This is certainly not a fault of the code, but a fault of the app configuration. 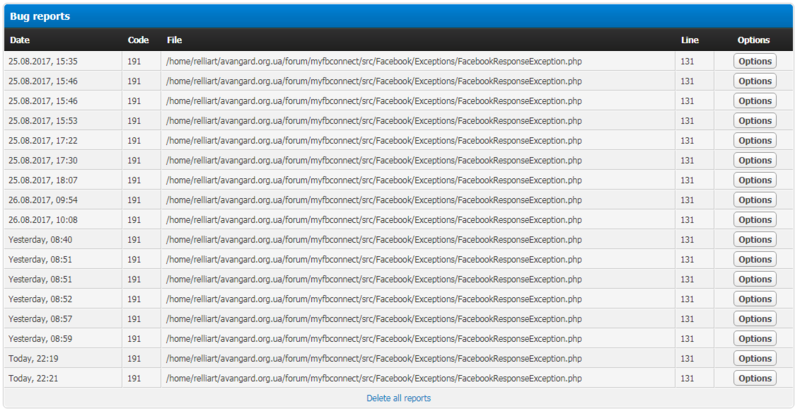 You won't go far by adding stack traces randomly, the error is on Facebook's side. "forum" should be the subdomain, adding the primary domain should whitelist all the subdomains. Try to add the site WITHOUT the https prefix (like: forum.avangard.org.ua). I did it and when press "Save changes" , facebook replaced it with http(not https) and gives the same error 191. I also tried to add both http://forum.... and https://forum.... to redirect url and it doesn't work. 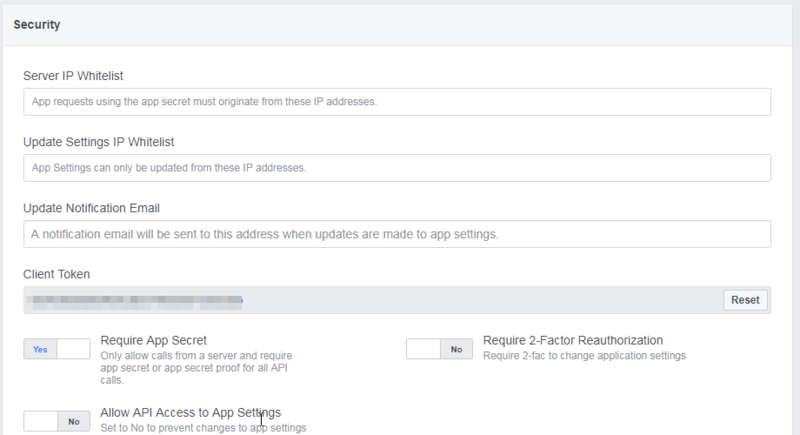 It would be great to get screenshots of app configuration from people who have https site and this plugin works on it. Then I could compare my settings and maybe find a mistake. Also while installation of plugin I had a message that it was unable to connect to 443 port of localhost. But I forced installation. Can it be the issue? I contacted hosting provider and was told that 443 port is open on my site. Can I test 443 port somehow? Maybe you've got to add both your primary domain and your subdomain (forum.). I would like to help you further but my FB account is locked at the moment and I have got no time to gain control over it. Will wait for their reply. 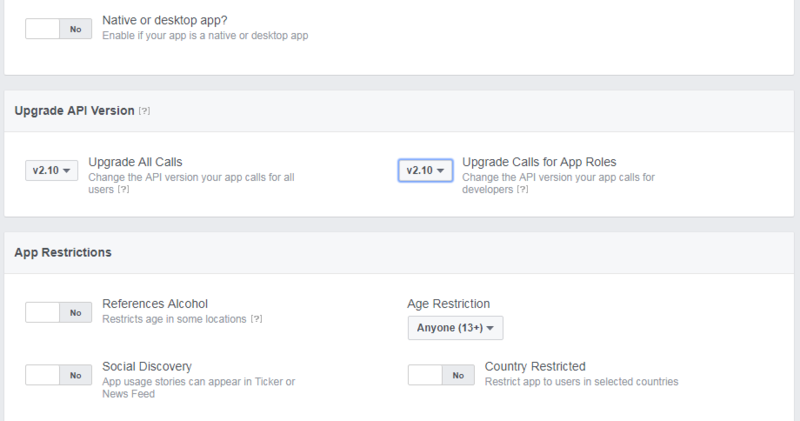 Facebook developer found a bug in your plugin. If will patch your code locally on my site and will wait for plugin update. Thank you for looking into issue.